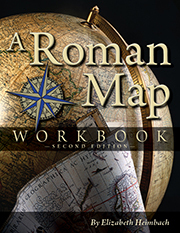 The Second Edition includes minor changes to the Roman World, Conquest of Italy, Punic Wars, and Pompeii maps. This edition also includes a copy of the Pompeii city plan without building names. The Roman Forum plan has been significantly expanded to include the Arch of Titus and buildings in its vicinity. The map of the Roman Empire under Trajan includes both the boundaries and names of the Roman provinces. Additions have made to some exercises, especially those accompanying the Roman Forum and the Roman Empire under Trajan. Correlation of A Roman Map Workbook with Latin for the New Millennium, Levels 1 and 2.